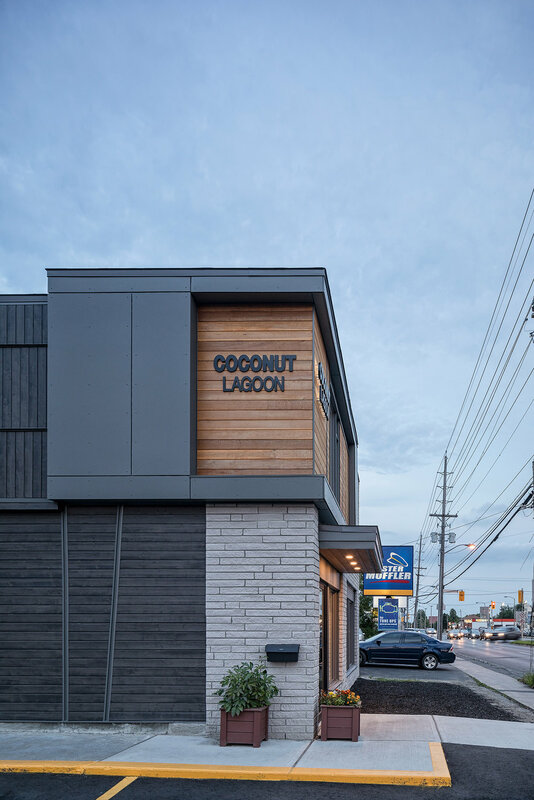 Project1 Studio was retained by the owner and head chef at Coconut Lagoon to redesign the exterior of the building and the interior of the restaurant. The intent was to transform the restaurant to match the sophistication of the food that was being served. The existing second floor balcony was removed from the front of the building, and aging stucco was replaced with a material palette of masonry, fibre-cement and cedar. The interior was designed to be a modern and free of the typical decor of an Indian restaurant, while still feeling warm and elegant. Rich wood grain elements create accents throughout the interior. A wood louver highlights the ceiling over the front dining area, while a wood wall with a diagonal feature is found in both the front and back dining rooms. The result is an elegant transformation that has made this destination restaurant a landmark in the neighborhood.